Ever wonder what kind of effort and eating is involved in scoring the kind of ab muscles that literally pop out of your stomach like a cartoon character? We do. 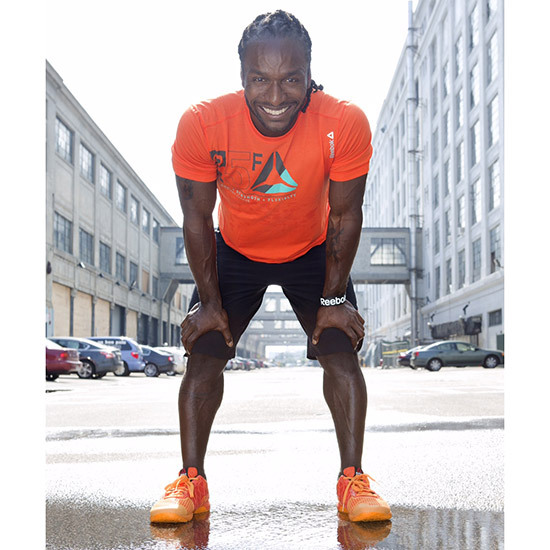 So FWx sat down with Equinox trainer and possessor of great abs Gerren Liles and had him take us through an entire day of his diet so we can find out what might be wrong with ours. Here’s how he fuels himself on a typical Thursday. We have to warn you, it starts early. 4:15 a.m. Breakfast: Gerren starts the day with egg whites with spinach, low-fat mozzarella, salsa and turkey sausage. 9 a.m. Morning Snack: Following some training sessions with private clients, he quickly grabs a Cookies and Cream Power Crunch protein bar. 11:30 a.m. Post-workout Refuel: After his own 90-minute workout, which includes countless box jumps and burpees, single leg sit-and-stands, split squats, lunges, kettlebells and ViPR (a regimen that involves weights that resemble giant logs) he downs a shake made from Dymatize whey protein mixed with water. 12 p.m. Lunch: Baked or grilled chicken with a romaine or kale salad topped with cashews, sun-dried tomatoes and balsamic vinaigrette. 3 p.m. Afternoon Snack: After teaching a 30/60/90 interval class focusing on cardio, plyometrics and static holds, Gerren has a Joyful Almond Smoothie from Juice Generation, made from almond butter, almond milk, cacao nibs, frozen coco-milk, banana, raw agave and ice. 7 p.m. Dinner: Following his last class of the day—Tabata (very short, but very high intensity intervals)—Gerren has more baked chicken and a spinach salad. When he feels like treating himself, he goes to Vegetarian Paradise 2 in the Village, where he always orders the same thing: vegan sugarcane drumsticks, and either the crispy Soul Nuggets or coconut soy chicken. If he’s really splurging he’ll have some brown rice. What do you think? Happy to hang onto your soft abs? Yeah, we thought so. Which Fitness Fad is Right for You?